Google has plenty of neat stuff planned for Chrome OS, alongside support for Linux apps which was announced at Google I/O last week, and that includes improved stylus performance, while Android apps that run on the platform will get support for SD cards. 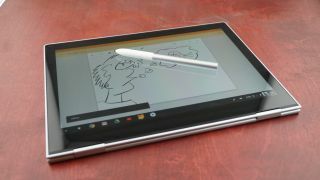 So, if you’re one of those Chromebook owners with a touchscreen and stylus model – like the pricey Google Pixelbook, which snagged our ‘best in class’ award – you’ll be pleased to hear that Google is planning lower latency drawing via a new API. This should drop latency from around 100ms to next to nothing, meaning that when you’re scribbling with your pen on the screen, it should be a far more natural-feeling experience. Also, with the latest beta of Chrome OS, Android apps running on Chromebooks can now access the contents of microSD cards (assuming your notebook has a microSD slot, of course). As Android Police spotted, the caveat is that this is a read-only affair right now, so you can’t write to the SD card, although we’ve seen reports elsewhere online that you may be able to – it’s just a flaky piece of functionality currently. And that’s understandable given that this feature is still in beta testing. Hopefully it won’t be too long before this ability appears in the release version of Chrome OS, because access to the extra storage space will doubtless be useful for those who do run Android apps on their Chromebook. Starting with the debut of Chrome OS 69, Google is also implementing app shortcuts as seen on Android, which give you different options tailored specifically for each app, all easily reached with a right click on the icon. So, for example, with the Gmail app, there’s an option to jump straight into composing an email. Furthermore, Gboard (Google’s virtual keyboard for Android) is expected to arrive in version 69, with a full range of features including GIFs, emoji and so forth. As Chrome Unboxed reports, a picture-in-picture mode is coming to Chrome OS, working as it does on Android. It lets you take a video playing in the browser or an app, and pop it out to become a standalone window that you can drag around, resize, and generally manipulate. There are a lot of neat bits of extra functionality incoming, then, and as mentioned at the outset, all this comes on top of Google’s big reveal that Chrome OS will support Linux apps via a virtual machine running Debian Stretch. All you’ll have to do is flick a switch to engage this mode. A preview of this feature has already been unleashed on Google’s Pixelbook, with other Chromebook devices expected to follow in time.